Why does the full moon seem bigger when it’s near the horizon than when it’s high in the sky? The moon illusion, which also applies to the perception of the size of the sun in the sky, has intrigued artists and puzzled psychologists for many years. The moon illusion refers to the fact that the sun and moon appear (to most people) to be a lot bigger when low on the horizon than when they are above us in the sky. Regardless of their position in the sky, however, the full moon and the sun both subtend an angle of about 0.5 degrees. There is no weird atmospheric refraction-magnification effect taking place. That said, there is a slight variation in the angle subtended by the moon depending on its actual distance from the earth, and atmospheric refraction makes the moon’s image slightly smaller in its vertical axis when close to the horizon, giving it an oval appearance. These physical effects reduce the image size of the low moon by about 10%, and certainly cannot account for the perceived enlargement of about 150%. To span the sky in a standard landscape photograph (35 mm lens in a conventional 35 mm camera) requires 100 full moons touching in a row. However, artists of all ages often represent a low-lying moon as being a lot bigger and sunrises and sunsets commonly show the sun as spanning a much bigger portion of a landscape than it actually does. 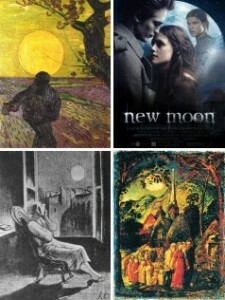 Examples of gross distortions of the sun or moon’s size in art can be found in Vincent van Gogh’s Sower with Setting Sun (ten times too big), Honore Daumier’s The Bluestocking (four times), Samuel Palmer’s Coming from Evening Church (five times), Ernest Briggs’ The Northern Twilight – Returning from the Fishing (four times). There are many explanations of the moon illusion, but none are entirely satisfactory. Among them is the notion that we perceive the sky as a flattened dome so that the horizon is from our internal perspective farther away than the zenith above, and so an object lying near the horizon appears bigger because it is scaled for distance. Think of it this way, scattered clouds across the sky give the odd impression of a gently curving sky as we look above us and then towards the horizon. It’s perhaps all about cues to distance, which in a sky are few and far between. The problem with this explanation is that, given that perception, the moon should appear bigger but farther at the horizon, but to most people it doesn’t – it appears bigger and closer. Experiments show that the apparent enlargement of the moon’s diameter varies between about 1.3 and 1.8, with 1.5 being typical of most people’s perception. Helen Ross of the Department of Psychology, at the University of Stirling, Scotland, and Adele Cowie have tested children aged 4 to 12 years and adults aged about 21 years by asking them to draw the apparent size of the moon on a photocopy of a landscape, both near the horizon and high in the sky. The mean ratio of the low to high moons was 1.57, and the size of the illusion did not vary significantly with age. “The illusion, like size-constancy in the near distance, is well established by age 4,” the authors say. Indeed, the illusion is present in full strength in young children, so cannot depend on perceptual skills that develop later in life, Ross says. 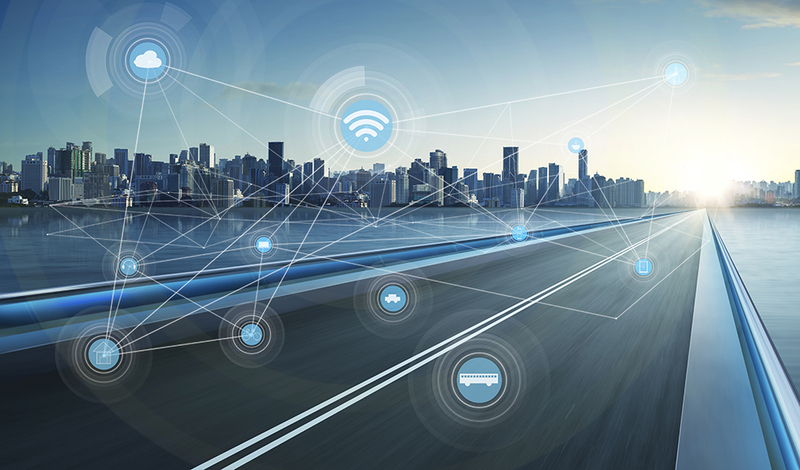 At near distances, spatial perception is governed by non- pictorial cues such as motion parallax, convergence, accommodation and stereopsis; at far distances, it is governed by pictorial cues such as image size, linear perspective and texture gradients. At near distances, constancy is automatic and it is very hard to distinguish between angular size (retinal image size) and true object size. At far distances constancy is imperfect, and distant objects appear small; but with experience we can learn to estimate the true size of objects, by taking account of distance and other cues. The authors suggest that the moon illusion may be similar to those geometrical illusions that show no clear age trends, and to size-constancy at near distances. Both effects are observed in young children, and this would imply that the moon illusion is caused by low-level automatic processes in the brain rather than by some sophisticated mental acrobatics that allow us to scale for distance, a function that improves with age. “If observers [of all ages] are not scaling the moon by its apparent distance, but by other factors, then the apparent distance is irrelevant,” the authors say. The sight of the terrain is the most important factor. It may be that size is scaled in relation to other sizes in the scene, or perhaps the terrain is a cue to orientation. Experiments show that tilting one’s head or bending over and looking at the moon through one’s legs reduces the illusion. Our perception changes depending on the angle at which we look at something relative to the local terrain. It seems there really is no single satisfactory answer to the illusion, but instead it is caused by a combination of factors. One final thought for fans of the new moon, as opposed to the full moon. When the new moon is “cradling the old moon in its arms” one can see the sun’s light faintly reflected from the earth, earthshine, on the region of the moon that is facing away from the sun itself and so otherwise dark. The partial disc of the moon illuminated by earthshine appears slightly smaller than the extrapolated circle of the moon’s “arms” would suggest it should be. This is not entirely apparent in a photograph but is easily seen with the naked eye. This shows how yet another factor, brightness, affects the apparent size of the moon. Tagged moon, science. Bookmark the permalink.